The very best pool cleaner is somebody that you hire to vacuum your pool once or twice a week. Ask your kids, your un-employed brother or hire a pro. If that is not possible, brother found a job or kids are lazy, then a robot will be the answer. Disclaimer I do not sell pool cleaners. I have extensive experience repairing and researching. Unlike web sites that give the top ten pool cleaner list of those THEY SELL, this website is independent of outside influence. The most value and convenience will be found in automatic (aka robotic) pool cleaners. Buy one used or buy brand new. Just buy one! All Robots are not equal For example, should a motor fail, Smartpool brand pool cleaners are "throw away". This means they are too expensive to repair as is true with most Maytronic Dolphin robots. Whether a pool is already in your backyard or still in your plans, a robotic "water polisher" will save you loads of time and money. I have not used my pools vacuum equipment in 10 years, in fact I threw away the vacuum tubing and head. Using robots will reduce filter back washing and save money on DE or cartridge replacements. An automatic pool vacuum WILL be, without exception, the best tool you buy for the pool. They are self contained and operate independent of the pool filtration system. Convenient disposable bags may be purchased for most bottom loading machines. Buying a top loading machine that requires 2 bags or a cartridge will eliminate the option of using a disposable bag and lock you into hand cleaning your filter media. Ignore this advice at your own peril. Disposable bags allow you to maximize the convenience of owning the best pool cleaner. Be certain disposable bags are available for the robot you consider buying. The Best Pool Cleaner will Not Be Heavy. Automatic pool robots are far from equal when considering weight. Dropping a dry robot into your pool is one thing, taking it out is completely different. The pool cleaner may be pulled to poolside by the cable but it absolutely can NOT be lifted out with the cable. Use the handle. By a large margin, Aquabots are lighter than Maytronics machines due to design of the motor mounting. 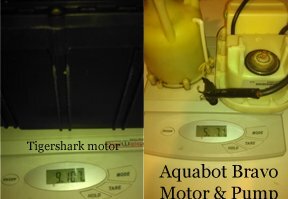 Below are photos showing the weight difference just between Aquabot motors and Maytronics motor. As you can see, the Maytronics motor alone, is almost 5 pounds heavier. The added weight is significant when trying to pull a water laden machine from the pool. And yes, Tigershark and Dolphin Diagnostic are almost identical. Below is a photo of a Diagnostic body next to a Tigershark body.I am certain Maytronics produces both. Aquabot Bravo is almost identical to Watertech Blue Diamond. Aqua Products build robots for Water Tech. Automatic pool cleaners help disperse chemicals and circulate the water in all quarters of your swimming pool. Cash savings are realized when your mega-watt pool pump rests while the low-voltage automatic pool cleaner works for a mere few-pennies-a-day. Although suction and pressure cleaners cost may less up front, they get you in the end. They require expensive booster pumps and will only run when the pool pump is running. The cost is comparable to true robotic pool cleaners so why not get the real deal? Remember, these are machines working in a hostile environment. They do and will break. Often times it is owner neglect and abuse that will result in costly repairs. Treat your robot with respect, always re-coil the cable and never lift the robot by the cable. Expect many years of flawless service.